Want to learn something well? Make media to advance knowledge and gain new ideas. You don’t have to be a communication professional to create to learn. Today, with free and low-cost digital tools, everyone can compose videos, blogs and websites, remixes, podcasts, screencasts, infographics, animation, remixes and more. By creating to learn, people internalize ideas and express information creatively in ways that may inspire others. Create to Learn is a ground-breaking book that helps learners create multimedia texts as they develop both critical thinking and communication skills. 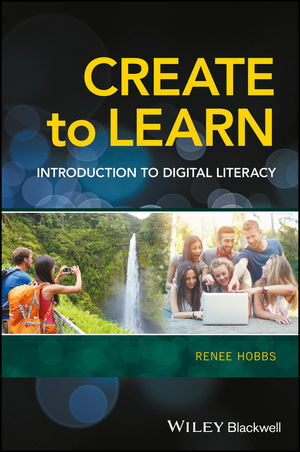 Written by Renee Hobbs, one of the foremost experts in media literacy, this book introduces a wide range of conceptual principles at the heart of multimedia composition and digital pedagogy. Its approach is useful for anyone who sees the profound educational value of creating multimedia projects in an increasingly digital and connected world. Students will become skilled multimedia communicators by learning how to gather information, generate ideas, and develop media projects using contemporary digital tools and platforms. Illustrative examples from a variety of student-produced multimedia projects along with helpful online materials offer support and boost confidence. Create to Learn will help anyone make informed and strategic communication decisions as they create media for any academic, personal or professional project.